Insights and Rants: I'm tired of being called a "racist"
One of the most annoying things about South African politics is the speed and rapidity with which any criticism of any ANC politician is dubbed "racist", especially if the minister concerned is accused of incompetence. If the critic happens to have a "white" complexion, no further justification is given. If the complexion is different, then some long tedious argument about "reactionary forces" is added, in order not to look too ridiculous. Take Gareth Cliff as an example. He is a presenter on a State-controlled radio station, as well as a judge on the SA Idols TV show. He has a "white" face, therefore he must be racist, because he wrote an open letter to the Government that was critical. 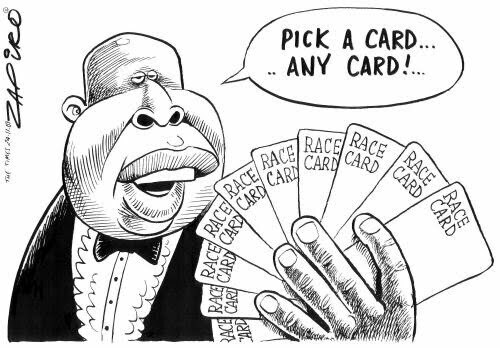 The Times contacted Nzimande's office about Cliff's letter and Nzimande's chief of staff, Nqaba Nqandela, said: "Please note that Minister Nzimande is not going to dignify these rantings of a racist with a response." Read it carefully and underline all the racist remarks that it contains. I couldn't find any. But that's because I must be a racist too. By definition. 4. Give up on BEE [Black Economic Empowerment]. It isn't working. Free shares for new black partnerships in old white companies has made everyone poorer except for Tokyo Sexwale. Giving people control of existing business won't make more jobs either. In fact, big companies aren't growing, they're reducing staff and costs. The key is entrepreneurship. People with initiative, creative ideas and small companies must be given tax breaks and assistance. Young black professionals must be encouraged to start their own businesses rather than join a big corporation's board as their token black shareholder or director. Government must also stop thinking that state employment is a way to decrease unemployment - it isn't - it's a tax burden. India and China are churning out new, brilliant, qualified people at a rate that makes us look like losers. South Africa has a proud history of innovation, pioneering and genius. This is the only way we can advance our society and economy beyond merely coping. I couldn't agree more with what Gareth wrote. He expresses our frustrations well. And before you rant and rave about how I'm a white racist South African who benefited from the Apartheid regime, stop right there and check the facts. I did not "benefit" from the state education system: my parents sent me to private schools, and used up a huge part of their income to do so. I only got to university by means of a bursary, i.e. on merit. I refused to serve in the SADF, the army that shot people in the townships. For this I nearly landed up in jail for 6 years. I was not without its cost, or risks. I met and worked with several Anti-Apartheid activists who later became cabinet ministers. I was not a "trendy lefty" who spent all day talking out strategy: I was a person who did grunt work like printing pamphlets at teaching media skills. Later I put my programming and computer skills to good use by helping media companies around the country, and today my software is used by companies that benefit all South Africans. So, don't bother to call me (or Gareth Cliff) a racist. It just shows how desperately stupid or totally ignorant you are. Perhaps you call me a racist because of my skin colour. That's the definition of racism, stupid! You may not be racist, but that still doesn't make you an honest man. You've been in prison after all and refused to serve your country. @Anonymous: No, I did not go to jail. I did NOT refuse to serve my country: I volunteered to do the alternative, "Community Service" for 6 years instead. I refused to carry a weapon, which is very different from refusing to serve my country. Military activity is only *one* way of serving a country, if you think that killing one's own countrymen is "service". I call it treason. Others call it patriotism. We agree to differ.